With the excitement and hype surrounding the recent Presidential election, it is understandable if you didn’t know about or follow the other historical election that happened in Nebraska: the race between Lynn Redding and Eric Nielsen for City Council (Ward 3) in Wood River, Nebraska. What makes this race historical is that Lynn Redding was the first person with a disability to run for political office in Hall County. Lynn has been a staunch advocate for disability rights now for several years, roaming the halls of the Unicameral, taking every opportunity to educate lawmakers on disability issues and policy. Her tireless activism on behalf of Nebraskans with disabilities has made her, as many in legislative circles have noted, a force to be reckoned with. 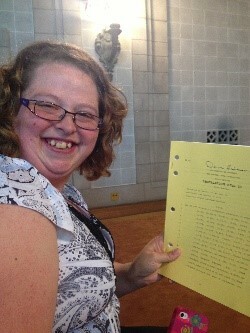 She played an important role in passing legislation to replace the words “mental retardation” with “intellectual or developmental disability” in Nebraska statutes and has doggedly worked to expand Medicaid insurance coverage to thousands of Nebraskans. I remember first meeting Lynn at a workshop on systems advocacy, where she came up to me and said that she was interested in this advocacy “thing”. Little did I know at the time how much of a challenge this would be for her, later learning that she had been institutionalized in her youth and lived in group homes through adolescence. As she admits she was a quiet, reserved individual who didn’t really say much at all. She was often frustrated by a lack of opportunity and low expectations by her providers, staff, and to some extent her peers. But something that day clicked with her when she decided to break out of her shell—perhaps her motivation to prove people wrong when they tell her she can’t do something, perhaps for once someone was willing to give her a chance and support her, or maybe both. She has not looked back since. This race was also important because Lynn made disability issues a central focus of her campaign. When asked about why she decided to run for office, she replies that she felt her community was not truly accessible to people with disabilities, at least as much as it could or should be; and in true Nebraska spirit she says, “If you want to get something done you have to do it yourself”. Her work on other state- and federal-level political campaigns gave her the connections and practical political knowledge. Her work as a disability advocate developed her confidence and her understanding of disability issues and political/legislative systems. Lynn did not win election, but she did receive a little over 25% of the votes in her Ward. Still Lynn remains positive about her experience. It was definitely a learning experience: “I’m tougher than I thought I was and I know more than I thought I did. I am able to handle anything now. I learned how to multi-task” (note that she was also a full-time student during the campaign). She says it has been a dream of hers to run for office. Lynn will most likely run for office again, perhaps next time for state senator-- her “dream job”. Lynn’s example shows that advocacy can have real and lasting individual benefits when people are given proper supports and opportunities which emphasize individual dignity, equality, and empowerment.